From the author of the New York Times bestselling Once a Runner—acclaimed by Runner’s World as “the best novel ever written about running”—comes that novel’s prequel, the story of a world-class athlete coming of age in the 1950s and ’60s on Florida’s Gold Coast. Quenton Cassidy is the skinniest boy in school, and also one of the fastest. Cassidy spends his afternoons exploring his primal surroundings: the local river, the nearby ocean, the lakes, swamps, and forests that dominate the landscape of the Florida everglades. While adventuring, Cassidy befriends Trapper Nelson, an iconoclastic hunter who lives in an isolated compound on the riverbank. By junior high, Cassidy dreams of becoming a basketball player, but Nelson’s influence runs deep and Cassidy begins to view running as a way to interact with the natural world. Warned of Nelson’s checkered past, Cassidy dismisses the stories as hearsay, until his town is rocked by the disappearance and apparent murder of a prominent judge and his wife. Cassidy’s loyalty to his friend is severely tested just as his opportunity to make his mark as a gifted runner comes to fruition. 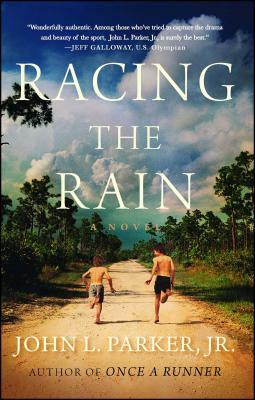 Hailed by National Book Award winner Bob Shacochis as a “lovely novel that reminds us that what is most valuable is life is the spirit to accomplish impossible things,” Racing the Rain explores a small town’s secrets while vividly capturing the physical endurance, determination, and mindset required of a champion. “A celebration of the purity of the sport” (Fort Worth Star-Telegram), it is an epic coming-of-age classic about the environments and friendships that shape us all.